Originally kerosene from 1870’s this scarce fixture is now ready for glass (finding old glass is usually a time-consuming and expensive hunt). It has been refinished and electrified, wire is colored to match fixture, we usually use 25 watt bulbs. Perfect for great rooms, motel lobbies, banks etc. We have hung several of these across the years in rooms with 12 foot ceilings over a table or 14 foot ceilings with no table. Walking under them is an awe-inspiring experience. Just to know that you have 250 lbs of light above your head is kinda like riding a roller coaster – you know it will be ok but your mind and your body send adrenaline filled messages of caution back and forth. I have several smaller ones in my home and every time I look up I kinda want to stand under it to gaze at the beauty but at the same time I want to run out from underneath… just in case. Ha! James, thanks for stopping by my blog. My Dad, Darrel Trotter restores the chandeliers and while for well over 30 years he did it as a compliment to his victorian home restoration business, he is now retired and does it mostly because it is in his blood and sees his work as a labor of love to bring these lights back to life in homes, businesses and showrooms. He admires the quality and craftmanship of these lights and his appreciation of them continues to grow. which is a brochure from Historic White Marsh Church. We have a medallion in our ceiling about 20′ up that evidently used to hang a chandelier similar to the ones you have pictured. Ours has been lost sometime a hundred years back. 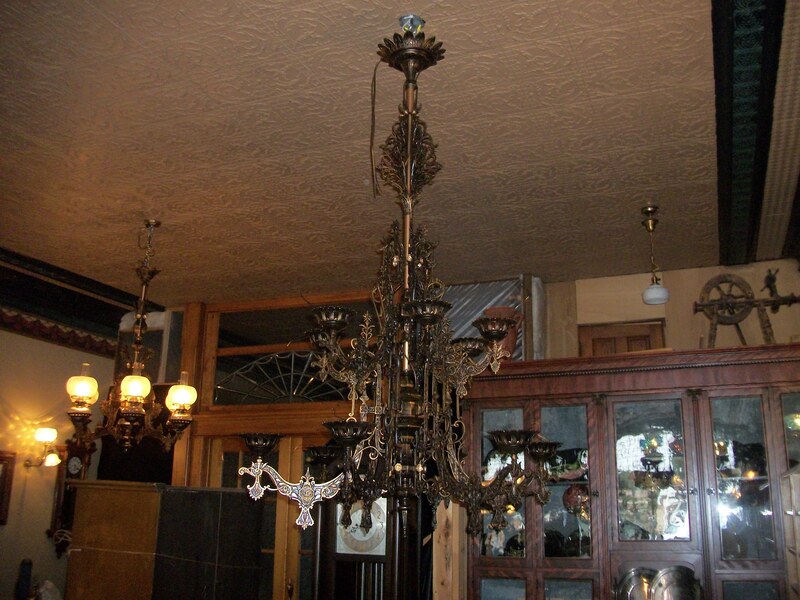 We are in the process of restoring this historic structure, and my dream is to find a chandelier for it. Any help would be absolutely appreciated. The link leads to a lovely light! I showed the picture to a man who recently lost a precious grandson and he said, “I would love to put that in the church in memory of our grandson.” I know we are a long ways from having the cost of it, but Wow! that is just what I’ve been looking for. I hope the day will come when we can put that, or one like it, up on that hook in our ceiling medallion.